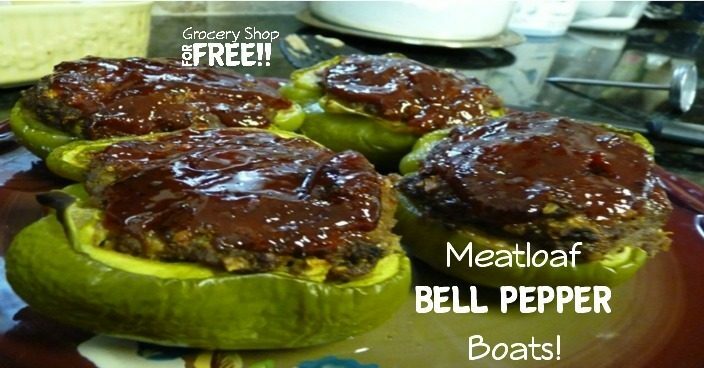 You are here: Home / Recipes / Dinner / Meatloaf Bell Pepper Boats! I seem to be on a meatloaf kick these days. Maybe it is because I had an over abundance of ground beef or maybe it is because we are a starting a community (soup) kitchen this weekend and our first meal will be meatloaf. I have made meatloaf my entire adult life and I don’t think I have ever made it the same. I never measure any of the ingredients and never know how it will taste until I finish. 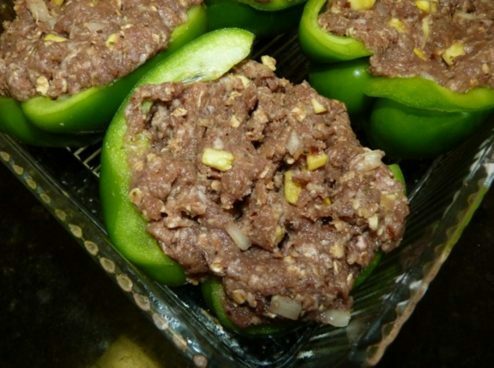 This weekend, however, for our community kitchen, I will be using a recipe just to make sure they come out in nice clean meatloaf slices. It is one that I have not even tasted but our church cook uses it all the time with great reviews. 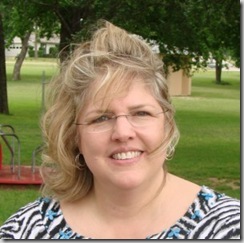 I will let you know how it goes and would love your prayers for a successful kick-off event. The meatloaf I made this week at home was not from a recipe, though I wrote it down for your benefit. It was so tasty and really served up nicely. I decided to share it! 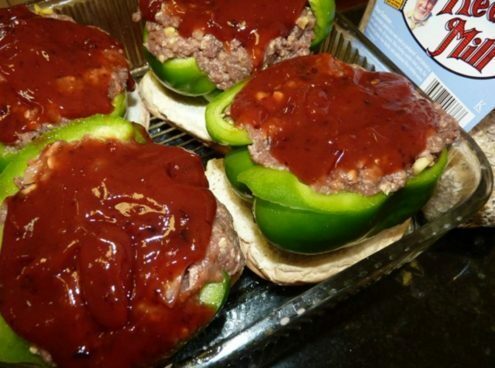 Place the hamburger buns in halves into the pan and cut the peppers in half. 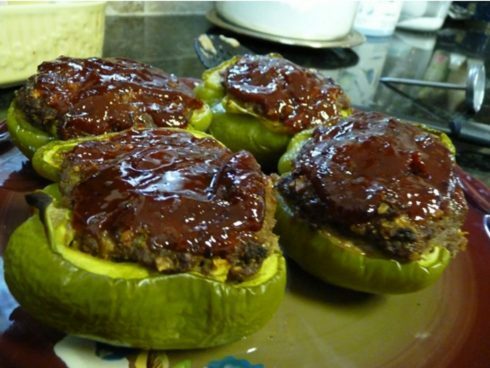 Scoop out the seeds and place one stuffed bell pepper on top of each hamburger bun half. The bread will sop up any grease from the meat. With your hands, mix all the loaf ingredients until well mixed. 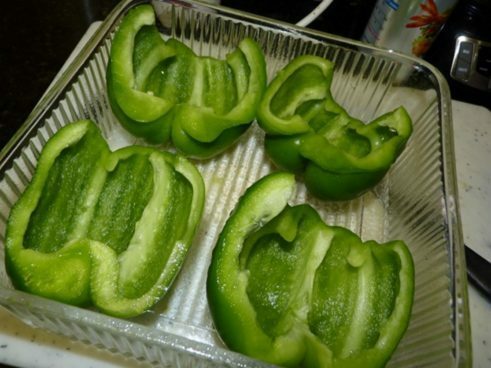 Form into 4 small balls and press into the bell pepper halves. Spread the topping on them evenly. Mix topping ingredients in bowl. Add on top of the meatloaf. Cook at 350 degrees for 45-60 minutes until internal temperature is 165 degrees. I personally like to make a lot of items ahead for the week. It makes the week go easier. Two weeks ago I made a ham it lasted 7 meals, then I made a turkey and that lasted 6 meals, this week it was 3 roasted chickens we had enough for 14 meals (this included enough to feed some of my extended family as well) This week we made a Pork Roast (I see pulled pork in our near future.) I have been making the large items on the weekends and my Mom breaks the large food items down into smaller meals during the week. My Mom is retired but watches our kids during the week and she loves to cook. We all eat several of these meals together . It works out well for both families!